FLORHAM PARK, N.J. (AP) — Sam Darnold is getting closer to being back under center for the New York Jets. Darnold acknowledged his foot was “a little sore,” but has his sights set on being ready to play Sunday at Tennessee after missing the Jets’ past two games. Darnold strained his foot against Miami on Nov. 4 and hadn’t previously thrown passes during quarterback drills during the half-hour window the media are allowed to watch until Wednesday. He said he took some snaps in team periods, and he and the team will continue to assess the injury throughout the week. Darnold didn’t feel all that rusty despite the long layoff from practice. 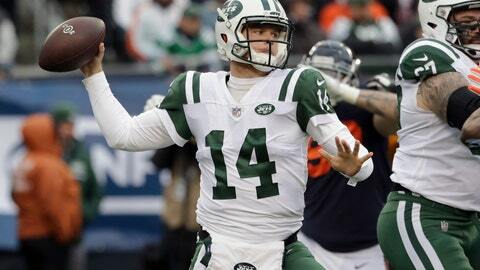 Josh McCown has started the Jets’ past two games, but was also limited as he deals with a sore back and right hand, which he cut during New York’s loss to New England last Sunday. Darnold still leads the NFL with 14 interceptions despite missing two games, and struggled in the three games he played before his injury. The No. 3 overall draft pick has had to balance making sure he’s completely healthy with being eager to get back on the field — even lobbying to play — to finish his rookie season on a positive note. NOTES: Darnold prompted some loud chuckles from reporters when he was asked about the helicopter hit McCown took to cap a 10-yard run for a first down in the third quarter against New England. “It was funny because right when that happened, Davis on the sideline, he buckles his chin strap. It was funny to see Josh kind of go after it because we all know the competitor that he is, so that was awesome.” … S Marcus Maye didn’t practice with shoulder and thumb injuries. Bowles did not rule out the second-year safety ending up on injured reserve. … WR Robby Anderson (ankle) and RB Trenton Cannon (hamstring) also didn’t practice. … WR Quincy Enunwa (ankle) and LB Jordan Jenkins (shoulder) were limited.